Developers have not, traditionally, enjoyed a very good reputation within the architectural fraternity - or with the general public, for that matter. At worst they are seen as sharp-suited pirates of urban space, stripping out centuries-old residential or commercial buildings to replace them with shoddy, design-by-numbers structures, thrown up with no driving objective other than maximising their cash before they move on. But times have changed. Whether it's economic necessity - driven by the lack of buyers for bad housing or poor office space - or just good sense, there is a growing number of developers out there that appear to be cherry-picking some of the UK's better practices to transform our urban wastelands and unloved spaces. This new breed appears to enjoy and understand the value of architecture and design. Some of them even consider architects their natural collaborators - the creative yang to their commercial yin. landlord. Which is undoubtedly why, since the earliest scheme (an Old Street factory conversion with AHMM), it appears to have prioritised quality. If you look at the firms the company has worked with since the mid-Eighties, Derwent director Simon Silver emerges as an architectural equivalent to Charles Saatchi - nurturing British architecture practices from their early years like Saatchi did for YBAs Hirst, Emin and Lucas. Along with AHMM, whose Angel Building won it a coveted Stirling Prize shortlisting in 2011, the established and emerging architects on its books include: Stiff & Trivillion, Duggan Morris, DSDHA, Hugh Broughton, Sergison Bates, Hawkins\Brown, BuckleyGrayYeoman, Bennetts Associates, Piercy & Co, Lifschutz Davidson Sandilands and Squire and Partners. What the architect gets is good, old-fashioned patronage. Stuart Piercy, of Piercy & Co, who is now on site with Derwent's Turnmills building in Clerkenwell, says: 'Turnmills has been seven years in planning...but [Derwent] kept us all the way through four complete redesigns. A lot of developers might have been tempted to try another practice.' The trust this generates is a precious commodity in today's tough marketplace. But is this a problem, and if so, for whom? God knows, UK architects have needed the work over the past five years. For all the rapacious practises of some developers and the perennial battles over community consultation and environmental impacts, there is a greater spirit of cooperation now perhaps than there has been for decades between a growing number of developers and their architects. You don't have to dig too deeply to find small to mediumsized developers which have clearly come to appreciate the architect's importance within a strategic team, valued for their expertise in engaging with a site's social, historical and architectural context as well as creating inspired masterplans and well-designed, appealing buildings. Those who get good word of mouth include GPE, Cathedral, Exemplar, Igloo and, of course, Urban Splash, whose fortunes may have dipped but it's still out there, and planning to embark on the next phase of the Hawkins\Brown-led refurbishment of Sheffield's iconic Park Hill estate. There is an undoubted London bias, however, when it comes to the really interesting projects. Long-serving Urban Splash collaborator Shedkm felt compelled to add a London office to its Liverpool base last year in order to win business from the design-savvy developers in the South East. Apart from Urban Splash, progressive developers outside of London are 'few and far between', says Ian Killick, director of Shedkm. He is, however, encouraged by young, forward-thinking consortia such as Capital & Centric, which has put Shedkm's scheme for Liverpool's Littlewoods Building back on the cards. The practice's London move has already paid off with its winning a major mixed-use project in Brighton, for Cathedral Group, at the end of last year. Cathedral - like most of the more design-led developers here - is an investor and regeneration specialist rather than an out-and-out developer. Cathedral's USP is regenerating difficult sites with mixed-use schemes (at Deptford and Hayes in particular) as well as pioneering clever schemes through public private partnerships (PPP) with local authorities - such as in the Clapham One project with Studio Egret West (see case study). For Cathedral's creative director Martyn Evans, good design and good development are the only way out of recession. 'Property is the building blocks of economic prosperity', he says. 'If we are going to change the way we work and find new ways of making money, property has to foster it, fuel it, create social enterprise, give people good places to live that they can afford when they aren't earning so much money, [and] give them nice public facilities. Christophe Egret, of Studio Egret West, says: 'There are developers that want an easy life, and want to keep on repeating what they've done before if the recipe works. They don't want to complicate their lives with mixed use. They don't want consultations because it's complicated, and they don't want to work with artists because it's messy. 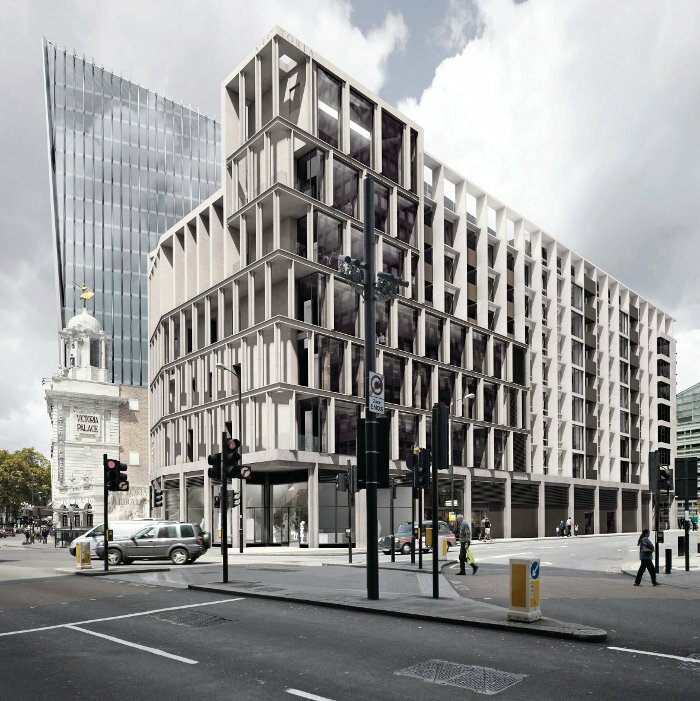 If 'public consultation' has long been perceived as anathema to developers, Cathedral has also inverted that stereotype with its commitment to 'meanwhile' Victoria Library housing and office, by Patrick Lynch for Land Securitiesuses - inhabiting its sites in the short-term to enrich usage for the long-term. For example, with the Deptford Project, a joint venture with Lewisham Council on a derelict site adjacent to Deptford station, Cathedral shipped in an old train carriage and turned it into a cafe. With the help of Studio Myerscough's funky graphics, it has become a real community hub. Cathedral also cleaned up and then let the railway arches to artists and artisans, and programmed markets and summer cinema events. No doubt it was trying to make the best of Network Rail dragging its heels over the development (four years and counting). However, thanks to these initiatives, says Evans, 'We have had a permanent public consultation facility for four years. All the staff who work in the cafe are trained about what's happening and can talk about our scheme. It enriches the process because the architects go and have meetings in the train carriages...It de-risks our project, which means that it happens. It makes the planning process easier because our consultation is deeper and better. It makes the marketing for the place easier. And it means there's no way we're not going to do the right thing on that site.' (For the record, Evans has promised not to turf the artisans out of the railway arches when the adjacent Rogers Stirk Harbour + Partners-designed flats are completed). There are one or two big players also surfing this evolutionary wave. Argent's efforts in King's Cross, for example, are widely appreciated, not least for the care taken to ensure that a good mixture of interesting practices work on individual buildings, but also for its commitment to investing in highquality public spaces that will help knit the disparate communities together. 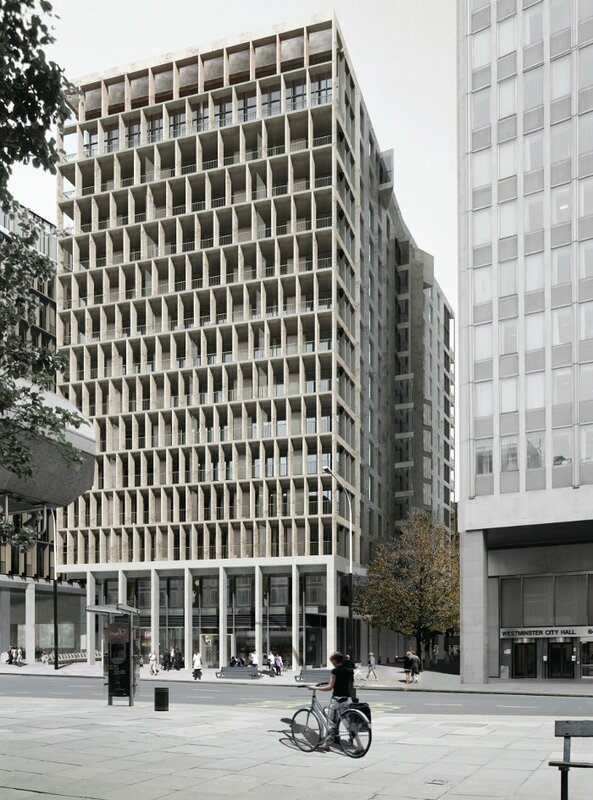 Meanwhile, Land Securities - the biggest commercial UK developer of them all - is midway through a 10-year, £2bn project in Victoria that harnesses the talents of Sir David Chipperfield alongside younger, edgier practices like Lynch Architects and Henley Halebrown Rorrison. Land Securities' head of London development management, Oliver Gardiner, would dispute that an appreciation of design and good architecture is anything new, but he admits that relationships between all in the design team are tighter these days. 'When we work with the teams we take the design side very seriously,' he says. Undoubtedly, using high-end architects is part of their strategy to draw a significant number of fashion businesses to the reinvented Victoria quarter. But plans for this area have evolved substantially since 2005, with a huge amount of input from its architects and Westminster's own planning department. Architect Patrick Lynch says Land Securities has agreed to almost every proposal he's made in the three buildings he's designed for them in Victoria. They are happy to listen, he says, as long as he can demonstrate that his interventions improve the building quality, longevity and performance, along with public realm and connectivity. 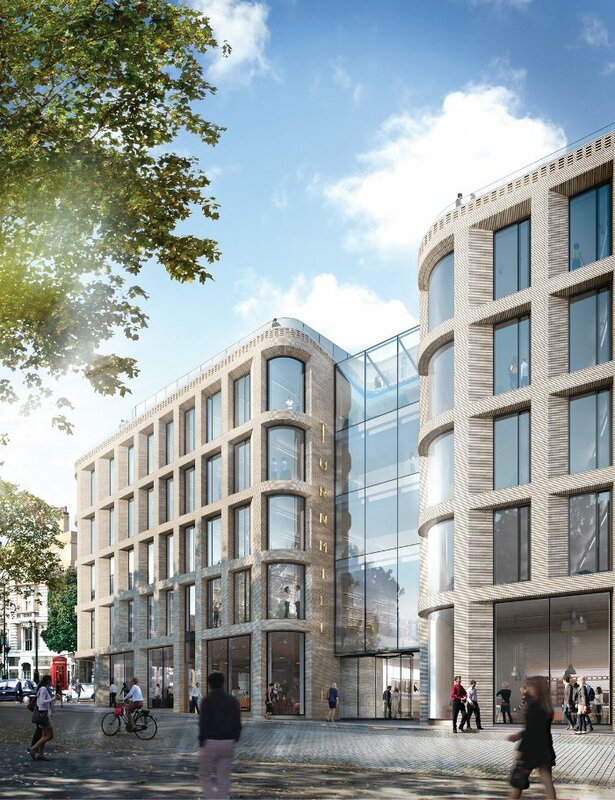 Project summary: A mix of retail, office space and affordable housing with a new library, the building will connect with the adjacent Victoria Palace Theatre, adding opportunities for use of its food, event and performance facilities. Constructed above TfL's proposed Victoria Station upgrade and the King's Scholars' Pond Sewer, therefore requiring use of a lightweight, engineered timber structure. Project summary: The old Turnmills nightclub is being replaced with more than 6,500 sq m of high-quality office space, with ground-floor restaurant and retail. Massing and materiality were inspired by Barbara Hepworth sculptures where textured exterior surfaces transform and curve inwards to become smooth interiors. 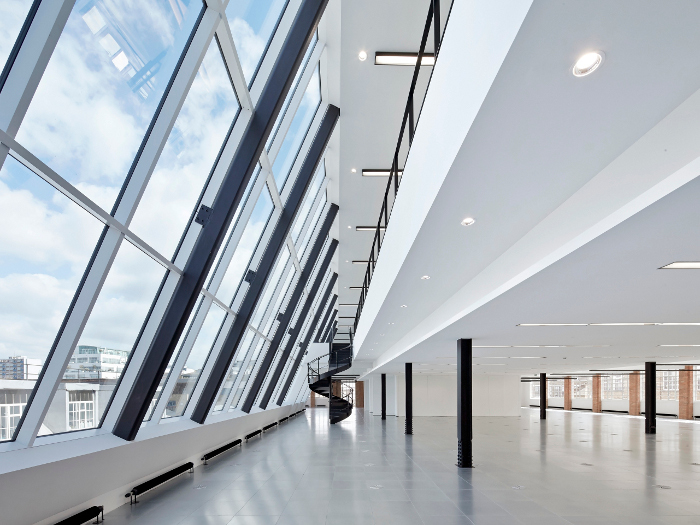 Each window reveal is chamfered to maximise daylight and views from within the light-filled, 'gallery-inspired' offices. 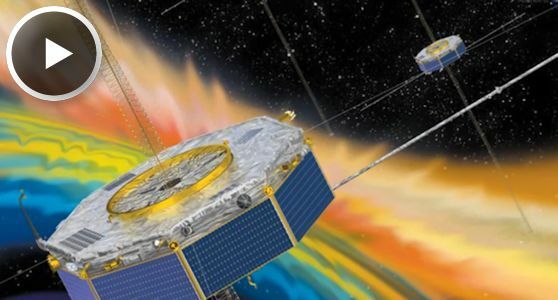 Prof Samuels says: 'The concept model is of a crystal object wrapped in a striated veneer. This veneer takes the form of different-coloured clay bricks by Petersen, Kolumba. There is a strong message here that this is inspired by research into the possibilities of facade and form. Although this may not be tremendously profound, a simple diagram is a nice thing in my book and it is good to have a 'concept model' on show. Many architects I know feel that they have to keep quiet about the underlying conceptual frameworks of the projects lest they appear over intellectual, unnecessarily expensive or somehow off-putting. 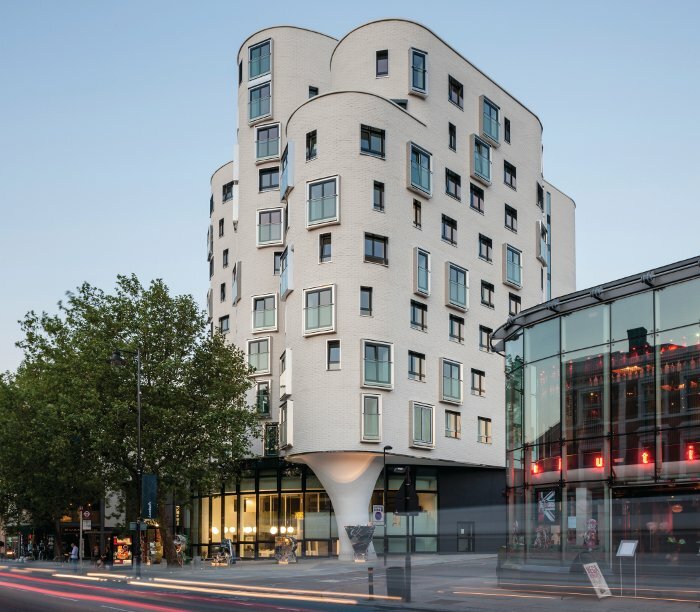 Project summary: A 12-storey, mixed use regeneration scheme, in partnership with Lambeth Council and United House, wrapping luxury private accommodation around a public library and performance space, cafe and GP surgery. Prof Samuels says: 'It is great to see the developer providing something truly useful. Furthermore, you have to applaud all concerned for building in a position of such extreme complexity... I just can't help feeling that the pursuit of dramatic architectural form, the perforated drum at the heart of the block, has relegated all other activities to the periphery. Inside, the drama of the drum is, however, unquestionable. 'It seems regrettable in such a densely urban place as Clapham that there is no atrium or courtyard space to allow the possibility of natural light, ventilation and vegetation. The site, fully occupied, is completely out of scale with the grain of the surroundings in plan.